If you decide you don’t love your sofa or any other piece of furniture within 28 days of receipt, we’ll probably sit down on a sofa and sob quietly. 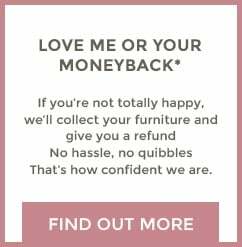 But then we’ll dry our eyes, come round, collect your furniture and refund your money with zero fuss*. *Read full terms and conditions here. We put our hearts and souls into making your furniture, so we’re 100% confident about their quality. That’s why all our timber frames come with a big, fat 10 year guarantee against faulty manufacture (Allowing for fair wear and tear. So if your pet elephant sits on it, we don’t cover that). Plus, we guarantee all other parts and materials for 2 years. Read the full terms and conditions here.